Can Fin Homes career making opportunity for all Indian candidates. Can Fin Homes is one of the leading Housing Finance Company in India. They have 186 branches/AHLC/ Satellite Offices spread across India at different locations. 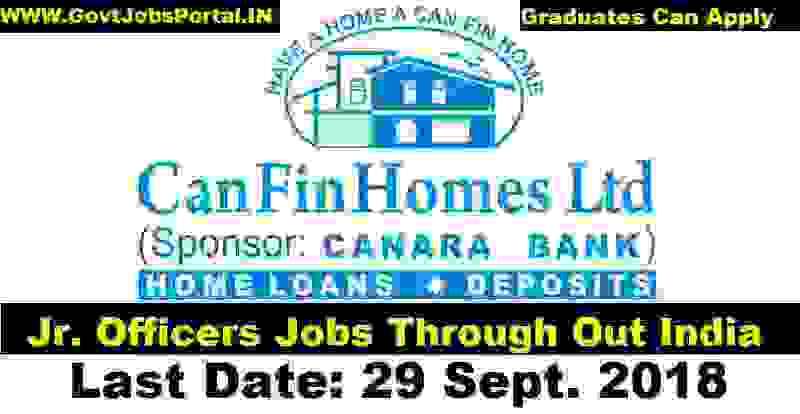 Can Fin Homes invites On-line Government job applications for the following posts on contract basis. 1) Junior Officer on Contract (50 Vacancies ). 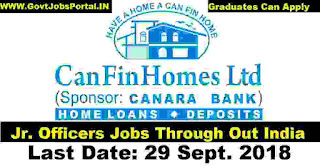 All Indian qualified applicants are needed to visit the official Company’s website whose link is “ www.canfinhomes.com” and submit the application online by paying the application fee. More information about these Government jobs on contract basis is given below in this article. Read the who article carefully before applying. Pay Band: Rs.16,000 per month. Education: All Graduate/Bachelor’s Degree Holder in any stream can apply for these posts. Age Bond: Must have age in between 21 years to 30 years for applying these posts. 2). Profile Name: Sr. Manager. Education: Only Retried Bank Officers form any Bank/Financial Institutions whose rank must be Senior Manager (Scale III). Age Bond: Must have age less than 62 years for applying this post. All eligible candidates from India have to apply online by paying the application fee of Rs.100. No reservation discount in the application fee for reserved category candidates. 19TH Sept. 2018 is the Opening Date to apply. 29th Sept. 2018 is the Last Date to apply. Candidates are requested to read the contents of the advertisement and ensure their eligibility before applying. The eligible candidates are required to apply ON-LINE though company’s website www.canfinhomes.com. clicking on the link. The link for registration of application is under the IMPORTANT LINK section above. Click on that link to fill up the online application. After completion of on-line registration, system generated print-out of Registered On-line Application should be taken and the same has be submitted at the time of interview along with other documents / certificates. Candidates need not send any print out of Application or any documents at this stage. However, if shortlisted for interview, candidates will have to submit the print out of application along with other documents / certificates at the time of interview. DISCLAIMER: We took this information from the following website: “ http://canfinhomes.com/”. All rights of the information which we shared goes to this website only.